“The bad guys always fired first.” This is the story of a small naval river group, attached to NSA Da Nang, simply known as River Rats, which has no real written history in the annals of the Vietnam War. The author, a young volunteer, paints a vivid picture of life and death while serving on the rivers in the northern-most province in South Vietnam. He ran medium-sized cargo boats on costal operations, often living for months on the rivers where he worked. From the beginning, in fall of 1965, until well after the 1968 Tet Offensive, he found himself on every river in I-Corps. Growing up fast, at the age of twenty, he was already the craft commander of a sixty-ton landing craft. He was responsible for his crew and the boat while feeling like a target in a shooting gallery—almost every day, on a shallow brown river. He would wake up each day to wonder if this would be the last day of his life. 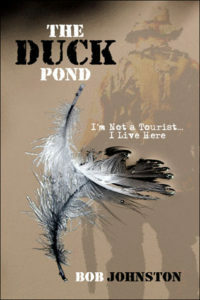 ‘The Duck Pond’ is available from the publisher now by simply going HERE and then entering ‘the duck pond’ in the book search box.